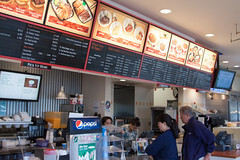 Indeed, walking in, you can see the slightly unusual configuration of most Zippy’s, with fast food on one side, and a dining room on the other (a few of the flagship locations also have a sushi bar). Since we were craving simple takeout options, I did the fast food side, getting my food to go and enjoying it outside in the fairly pleasant weather. I decided that Zippy’s was one of the best places to try the one remaining cornerstone of Hawaiian cuisine that I hadn’t yet experienced: the Loco Moco. 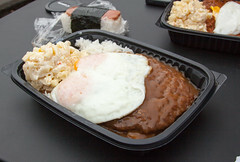 A culinary tradition coming from the Big Island, your standard loco moco is basically a variant of the “plate lunch” I’ve already described in the previous posts: a large plate of white rice, topped with a hamburger patty, two fried egg, and brown gravy. Oh, and the obligatory macaroni salad…. It’s basically “plate lunch” meets “salisbury steak”. And I’ll have to say, while setting no records for healthiness, it was an enjoyable meal: the hamburger patty is nicely done, and served up in a rich gravy that’s actually pretty flavorful (instead of the usual emulsion of fat and salt) that I would have enjoyed by itself, but it actually worked quite well combined with the fried egg and the rice. Very, very starchy and calorically dense, but I can easily see why the Loco Moco is a semi-popular dish. Carol, meanwhile, in a concession to dietary restraint, instead opted for the small version of the “Chili Moco”: About 2/3 as much rice, chili instead of the hamburger patty and gravy, and only one egg, this was still a tremendous amount of food, but the same overall experience as the Loco Moco. 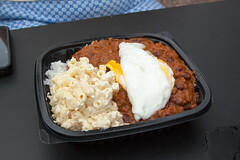 While distinctly not Texas-style chili, Zippy’s chili is particularly pleasant, and actually combined well with the egg and rice. 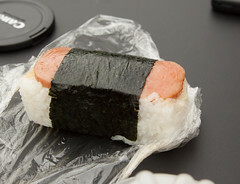 Also, our order was somewhat delayed (just a few minutes) at Zippy’s, and the staff was very pleasant about it, throwing in a pair of Spam musubi to make up for the delay. Several people had mentioned that this was one of the better places to get Spam musubi, and I’ll have to agree that it was quite good… although I’ll actually give a slight edge to 7-Eleven. 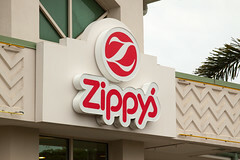 Overall, however, we were really pleased with Zippy’s. The food is good, fast, and relatively cheap, and they’ve got most “local Hawaiian” options nicely covered. In fact, looking at what the other patrons were ordering, next time I’ll go, I’ll probably try a different item, the Zip Pac, with fried chicken, teri beef, fried hoki, and fried spam all on a bed of rice with nori furikake, since it looked particularly good.